Everyone knows them. Everyone loves them. But what happens when culinary creatives take the standard hot cross bun and turn it into a mouth-watering dish in its own right? Magic, that’s what. 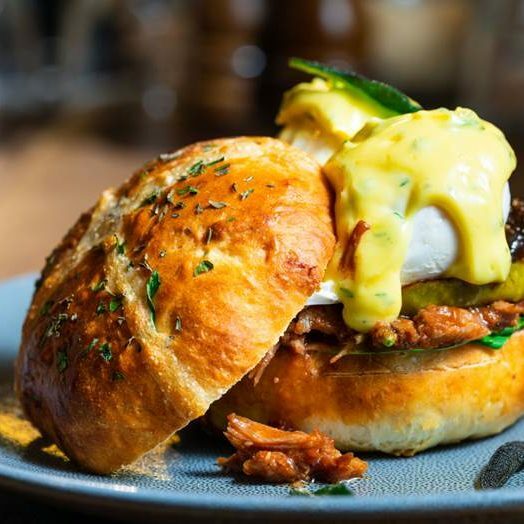 Their limited edition Hot Cross Bun Menu makes Chapter IV the place to be this Easter weekend. From the Hot Cross Bun Benedict – which features sticky BBQ pork, soft poached eggs, fresh spinach and caramelised apple with an apple cider hollandaise held together by a warm sage and caramelised onion hot cross bun… *drool* – to Hot Cross Cakes – warm cinnamon, ginger, ricotta and currant hotcakes drizzled with a crème egg filling, layered with milk chocolate ganache plus a giant crème egg perfectly placed on a bed of chocolate soil to tantalise your taste buds – there is almost too much to try in one sitting. The Easter bunny has hopped up his game at Kiss the Berry this year. The Hot Cross Berry Bowl features banana, pea protein, cinnamon, nutmeg, sultanas, coyo, chai caramel and a Sol Breads organic hot cross bun. It’s available for a limited time only, so hurry! 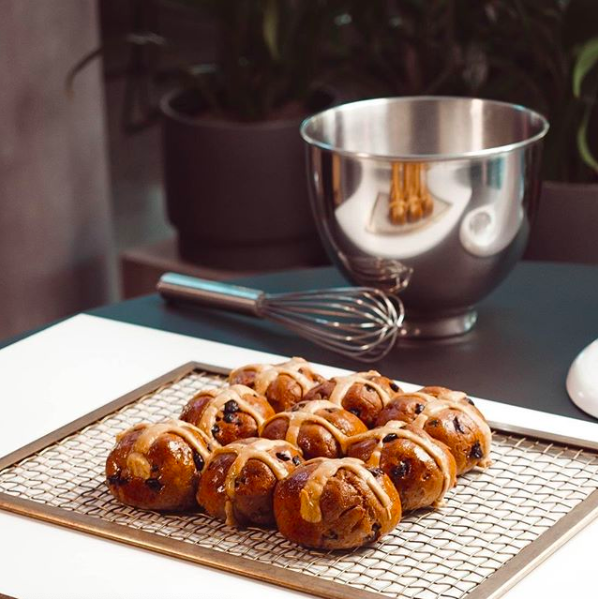 They’re renowned for their gluten-free doughnut creations, but Nodo have stepped up the game this year with a steaming batch of gluten-free hot cross buns, too! And, in true Nodo style, they’ve also created the most delicious, hot cross bun-inspired doughnuts, too – coated in chocolate, no less. You didn’t expect the Bam Bam crew to pass up an Easter-inspired menu addition, did you? Their classic croissant pastry, rolled with soaked sultanas, filled with spiced custard and topped with cream cheese, their brand-new Hot Cross Croissants have to be tasted to be believed. Sometimes, the simplest creations are the most delicious – and it seems that is one philosophy that Bam Bam Bakehouse’s little sister, Cubby Bakehouse, is running with. And why not? Their hot cross ‘baggies’ are flying out of the cabinets! 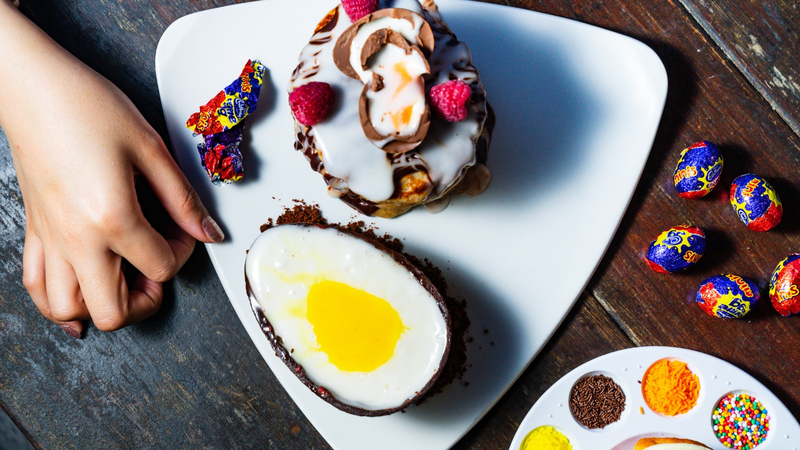 Woodfired, sourdough hot cross buns… an Easter dippy tray with doughnut fries, malt chocolate crumble and salted caramel… an Easter surprise cruffin, with hazelnut crème pat and a smartie-filled chocolate egg? Yeah, Paddock Bakery do Easter pretty darn well. 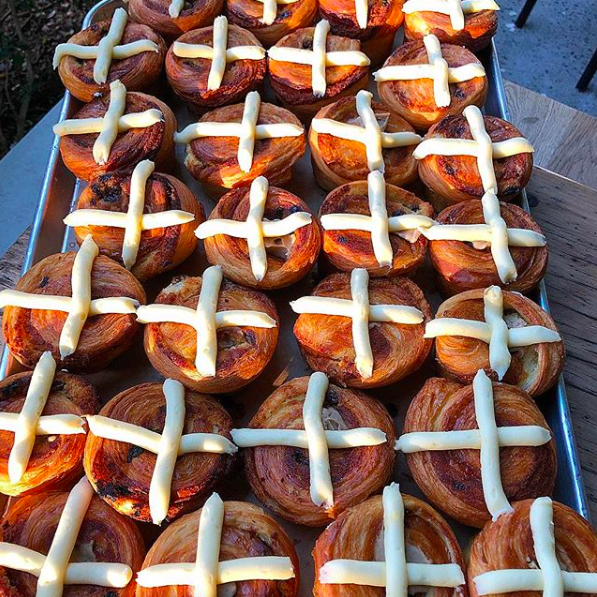 Miss Kay’s are adopting a ‘go hard or go home’ approach to Easter menu items, with their exclusive Hot Kay’s Buns making mouths water all over south-east Queensland. Picture a deep-fried hot cross bun and a deep-fried Crème Egg topped with vanilla soft serve and chocolate sauce. Yeah, we know. The Messina messiah has arrived. A selection of heavenly eggs – a Holy Trinity, if you will – has officially hit Messina stores, and you’d better get in quick as they’re not going to last long. 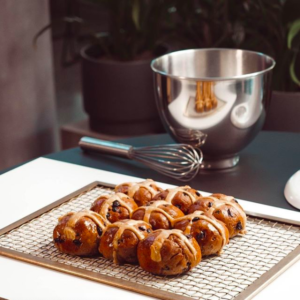 The Holy Hot Cross Buns egg is filled with gelato that has been cooked with hot cross buns and large holy chunks of toasted and spiced buns, the centre is filled with gooey dulce de leche and coated in a milk choc glaze. You can also try the Lord Lamington and the Saint Pistachio. Cricelato Gelato, renowned for their quirky and vibrant selection of gelato made in-store will be serving hot cross bun flavoured gelato, made with real fresh hot cross buns, as a one-off special over the Easter weekend. 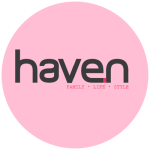 Get in quick, as it certainly won’t last long!